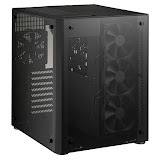 The PC-O8 features a two compartment design,separate the system into two compartments, one is motherboard and graphics card section, another one is 3.5″ HDD and power supply unit section. HDD rack can support six 3.5″ drives and two 2.5″ drives. The PC-O8 is designed to support the majority of commercially available integrated water coolers.